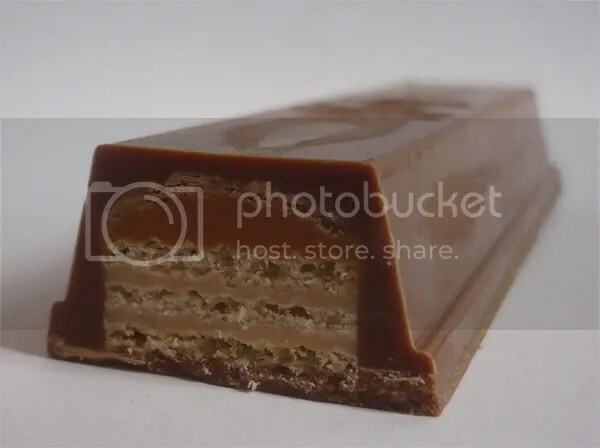 I am a huge fan of chocolate bars filled with peanut butter, and after I heard of the “new” Kitkat chunky peanut butter bar, I’ve been to the gas station some time away from my home just to get it. This bar was “new” in Germany, everywhere else it was discontinued earlier – and in Germany it did not have any chance as well: Soon after it came out, it wasn’t available anymore. For me it was a bummer as peanut butter flavored chocolate bars are totally rare around Germany. The milk chocolate coating is really greasy and I cannot say anything about its smell, as it is overshadowed by the scent of peanut. The coating is really thick and makes more than 60% of the bar. Despite of being greasy, the chocolate is really tasty. The ends of the bar contain really a lot of plain milk chocolate, which is creamy, sweet and milky. 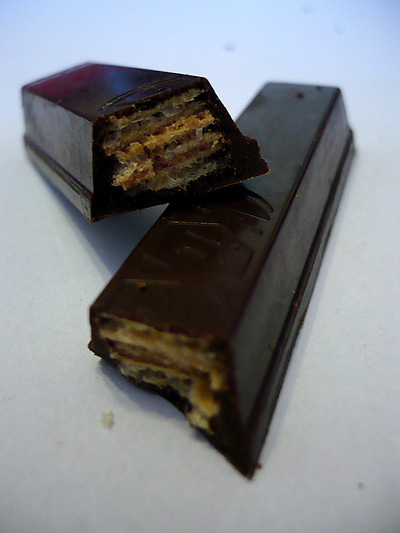 The inner self of the bar looks like a usual chunky: three layers of wafers, divided by two small layers of a sweet peanut crème. The wafers are topped by a thick stripe of peanut butter. Let’s get to the taste… Well, I was kind of surprised. I know you cannot compare this milk chocolate coating to any real confectionary chocolate, and it is a little unfair to have eaten some right before trying the bar. Still, the chocolate is awkward! This is one of the worst Kitkat coatings I’ve ever eaten! Total Nestle failure! After I’ve tried the chocolate, I got the reason why the demand was that low; every other KitKat chunky comes with better chocolate! Still, the taste of the center is a really good mixture of nutty, salty peanut butter, cocoa, and the wafer layers. But compared to Hershey products, this one is a real failure, as it is plainly sweet most of the time; the absolute opposite of what I thought after I first smelled the peanut butter. The little amount of salt coming from the peanut butter filling cannot make up for the entire bar. The texture is a little too smooth for a kitkat. Since Nestlé replaced the old version of KitKat with the crunchier ones, this chunky seems to be the odd one out. Especially with the peanut butter it gets rather soft while chewing it and mixes up really well. So, all in all I expected more of it. Even the white Chunky I did not like too much was better! There’s a chance I’d still go for it if it was available in Germany, just to get the peanut buttery taste every now and then, but I’d rather order some better products from the US instead of buying this…under-average Nestlé product… Sorry guys… I really got why you threw it out of your production line and why no one wanted to buy this thingy…Way too sickly and simply a no-go. Four crispy wafer fingers covered with dark chocolate it says on the back. 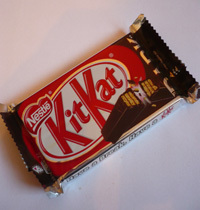 When I was a child, I used to love the original version of Kitkat and I know I ate it very often. But during the last five or six years I haven’t eaten any version of Kitkat and so I thought I should give the dark version a try. When I did the first bite I was literally shocked. I haven’t eaten much dark chocolate for a long time as I usually prefer the sweeter versions. And to be honest, at first I thought I would not make it through one finger. 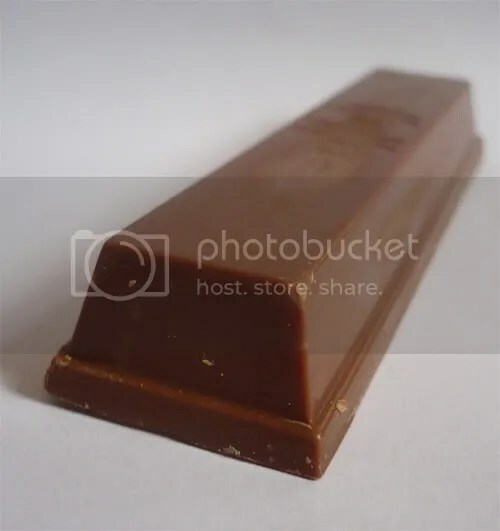 Surprisingly, after a while I really got into to the taste of bitter chocolate and the wafer finger contains a bit of cocoa butter which makes the bar sweeter on the inside while chewing. It is not as crunchy as I remembered it to be, but the consistence is really good the way it is. Neither too hard, nor too soft. One bar weights 45g and contains 236kcal, 2,5g protein, 25,0g carbohydrate and 13,3g fat. I got it for 50Cent in Woolworth. They are not sold in most of the big supermarkets. Rossmann sells them as well in Germany. It is awesome if you prefer dark chocolate and think the original one is too sweet. And I will definitely buy an original one to compare!